Antique Blue Willow china is a beautiful collectible with a story to tell. It is no wonder that it is the most collected pattern in the history of china and beloved by enthusiasts everywhere. 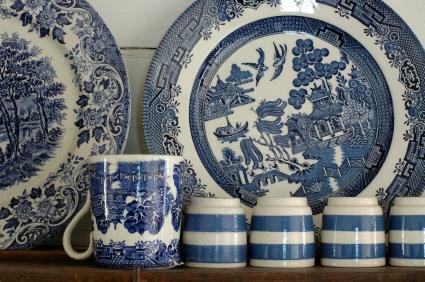 The Blue Willow pattern has been recreated by many manufacturers but each keeps the same basic elements of design. It was designed by Thomas Turner and engraved by Thomas Minton in 1780. Minton was apprenticed to Spode and the design was introduced into Staffordshire in 1784. It was soon personalized and released by Adams, Wedgwood, and other manufacturers of fine china. This pattern has been in constant use for over 200 years. It is an excellent example of transferware. Blue Willow china is the illustration of an ancient Chinese legend. Each component of the design tells part of the poignant story of true love. In ancient times a young and beautiful Chinese girl by the name of Koong Shee fell in love with her father's servant, a young man named Chang. Because the girl was the daughter of a wealthy nobleman and lived in a palace she was forbidden to marry a mere servant. Koong Shee arranged to meet Chang secretly under a willow tree each day and their love grew. Her father was furious when he found out and fired Chang. He then erected a crooked fence to keep Chang away. Soon Koong Shee was betrothed to an old man, a friend of her father. Her wedding was to be as soon as the fruit trees were in bloom. She couldn't bear to give up Chang and fed the birds as she poured out her sorrow to them. Just before her wedding Chang slipped into the palace and the two escaped and ran away to a small house where they were married. Koong Shee's fiancé pursued the pair and found them. He angrily burned their house to the ground and killed both of them. Upon their deaths the lovers were transformed into doves and lived together always. Following are some examples of Blue Willow. It is important to use a gentle soap when washing any antique china. Place a folded dish towel in the bottom of the sink and fill it with warm water. Use a gentle soap or even baby shampoo to wash the dishes and then rinse them well in clean, warm water. Place the clean dishes in a rack away from sunlight to air dry before storing them. Towel drying can leave tiny scratches. If you are going to use your collection for display only then you have a couple of options. You can keep them in a glass front cabinet, again away from direct sunlight. This is the best way to display a large collection which contains an assortment of sizes and shapes. You can also have the plates mounted in glass front shadow boxes and hang them on the wall. You won't be able to use them but the plates will be protected from possible chipping and breaking. Some people use a hanger that clips around the plate. These are very inexpensive but are not recommended. The delicate plates can crack from the pressure put on them by the spring. It is most important to enjoy your collection. Whether you are using it for serving or only displaying it, put it where you can enjoy it and your guests can see the beautiful story of the young Chinese lovers.